paint was unfaded or soiled. i polished and cleaned before having professional match and place in spray can . I am curious about this-were spares painted silver or black? 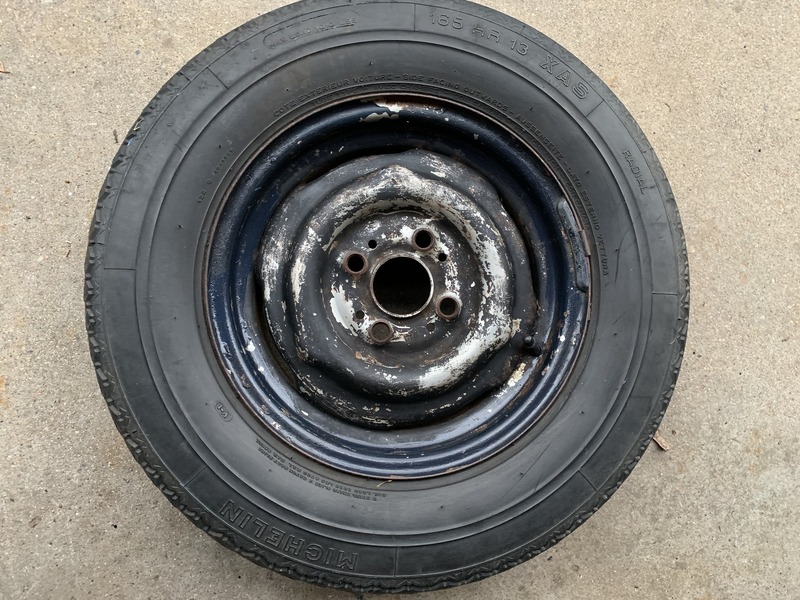 The spare in my ‘72 has scuffed up black paint, which I thought was odd, but I feel like I read somewhere here spares were painted black for some years. Bluehills, my guess is the silver has flaked/worn off somehow, or someone repainted it black. The wheels were originally painted black, then the faces sprayed silver. 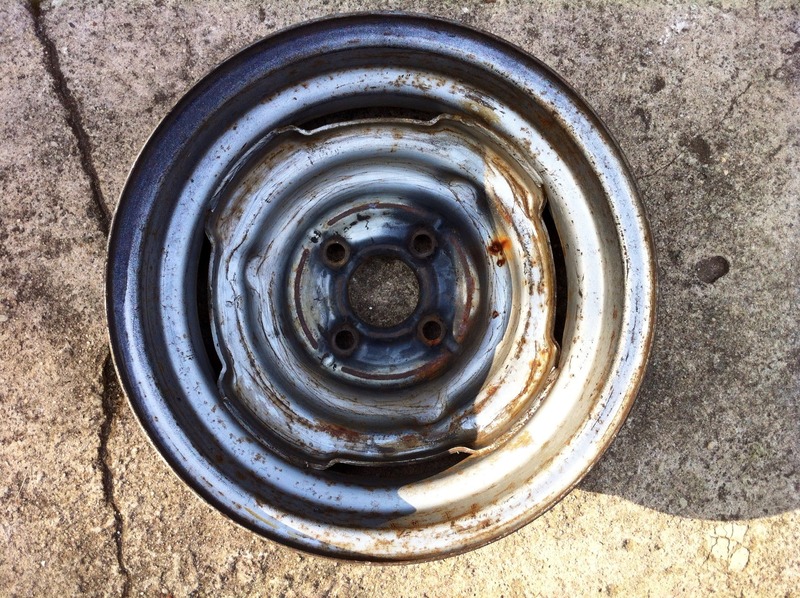 I don't think there was a distinction between spares and road wheels; they were identical. Oh, I'm sorry! 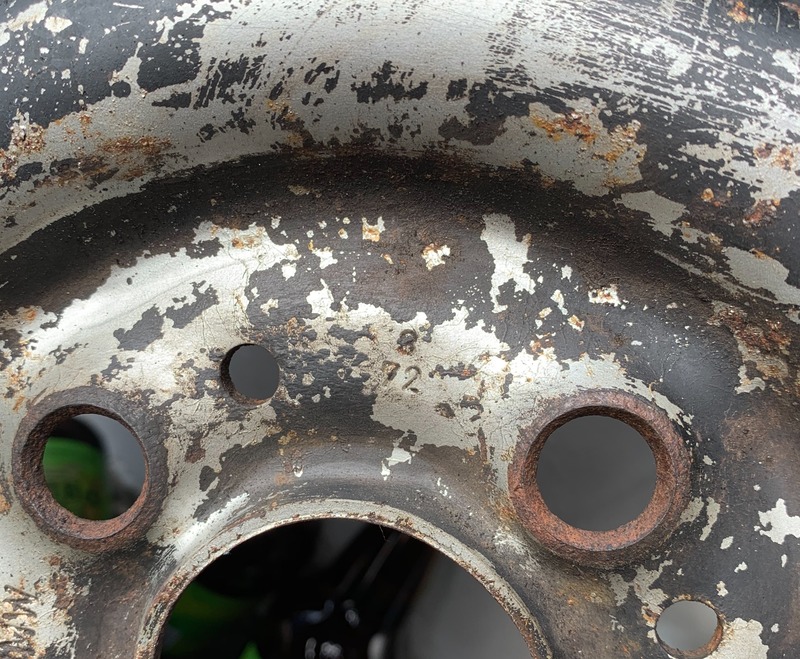 I thought both wheel photos were the original finish. Now I feel like a heel. I'd never criticize another man's spray can paint job, especially if you looked closely at any of mine. 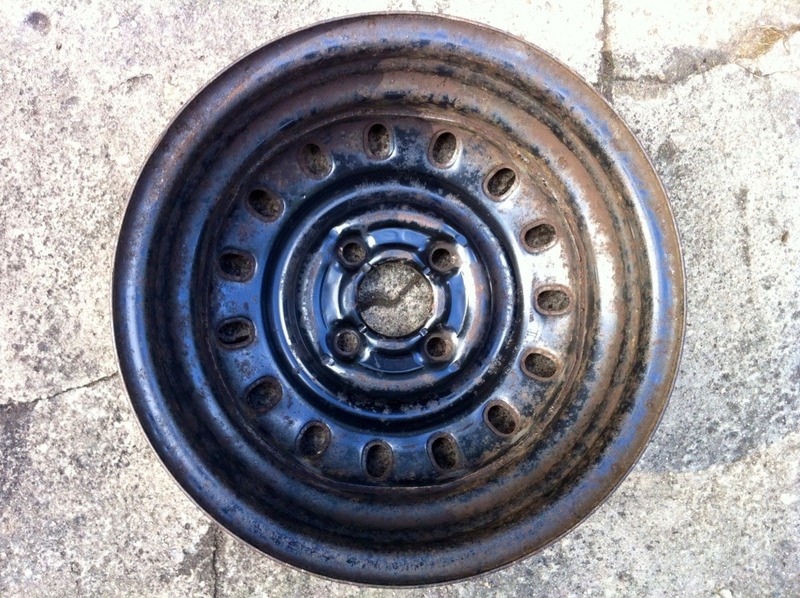 The rim above appears to have a coat of black paint sloppily-applied with a brush, post-factory, over the factory silver. 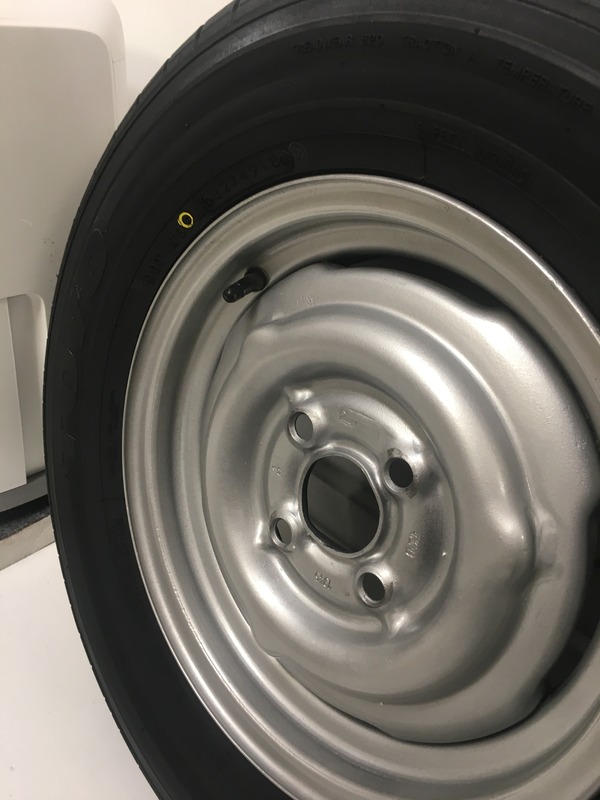 Notice that even the wheel weight had been painted black. That black re-painting is now peeling off. But the facts may be more complex than this. Why? 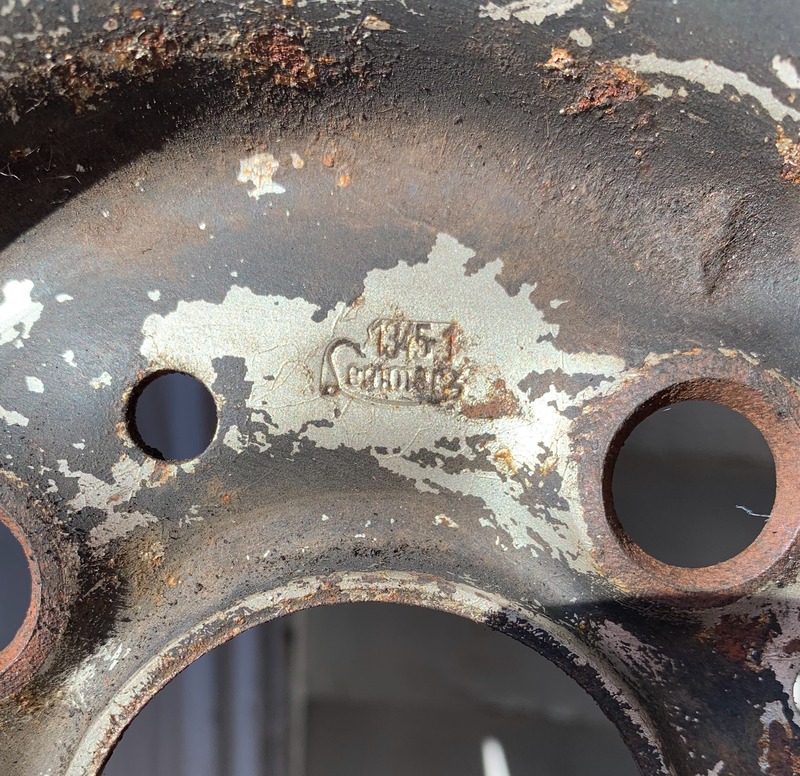 Lemmerz was the primary supplier of steel rims for ‘02’s (Kronprinz was secondary, Solrad was tertiary). 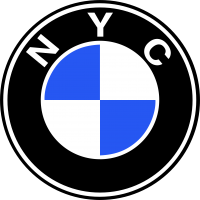 Most Lemmerz steel rims supplied to BMW for round taillight ‘02’s — not all — were black rims that had silver paint applied over the black paint, but only on the front face. Thus, the front faces were silver and there was silver overspray reaching parts of the outer barrel and rear face. But the rear face remained essentially black. 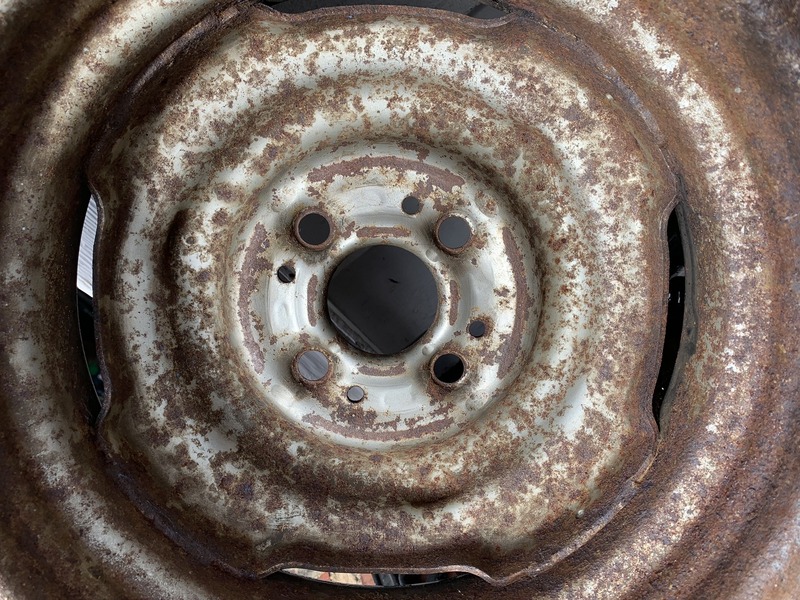 Most Lemmerz steel rims supplied to BMW for round taillight ‘02’s — not all — were black rims that had silver paint applied over the black paint, but only on the front face. Thus, the front faces were silver and there was silver overspray reaching parts of the outer barrel and rear face. But the rear face remained essentially black. +1. Exactly the way my '69 came from the factory, as did my 73, whose wheels still had their original paint when I bought it in 1978. So for a proper restoration, paint your steel wheels black on the back side, then overspray silver through the holes! Interestingly, the ATS early style alloys were done the same way. 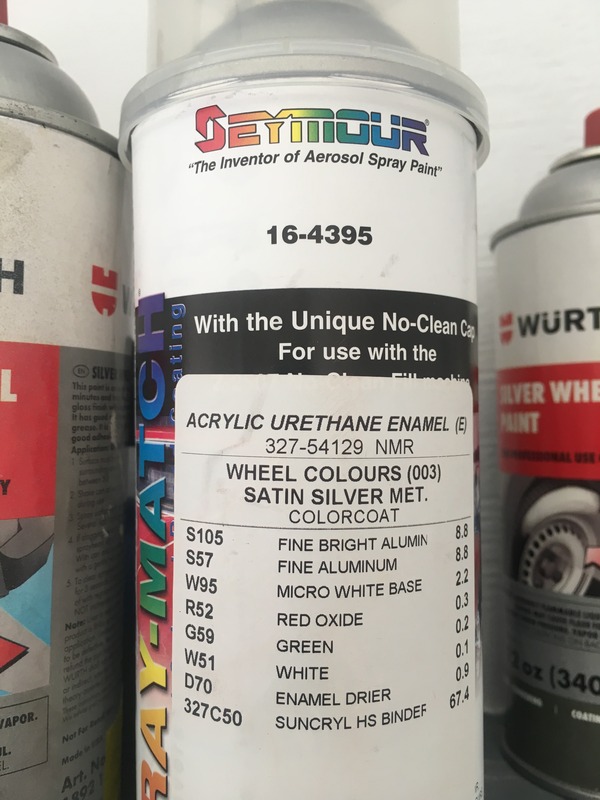 They were painted with a dull grey primer front and back, and then only the front sides were painted silver, compete with overspray through the slots and lug nut holes. I have an unused spare alloy wheel and that's the way it was painted. 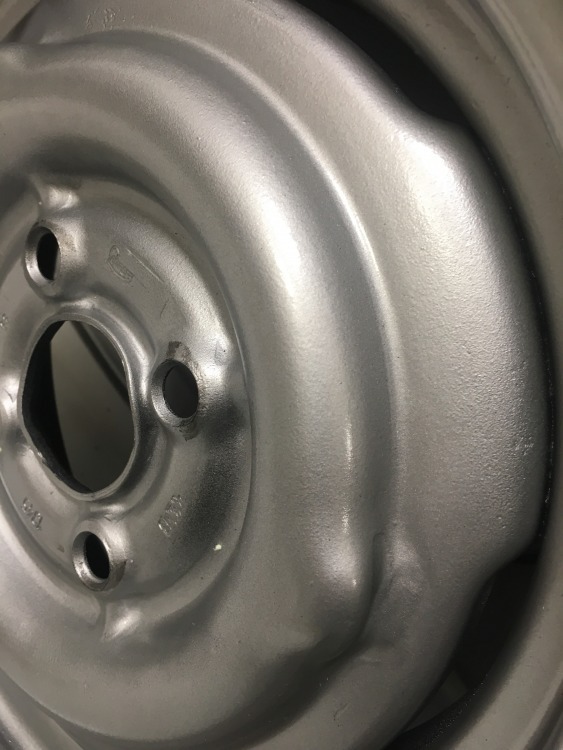 When I got my e30 steel wheels refinished the guy insisted on spraying the whole wheel black first before the front face was painted silver. He did this because “that’s how BMW had all of their steel wheels”. Original it may be but it does make any scratches/ damage a lot more visible. 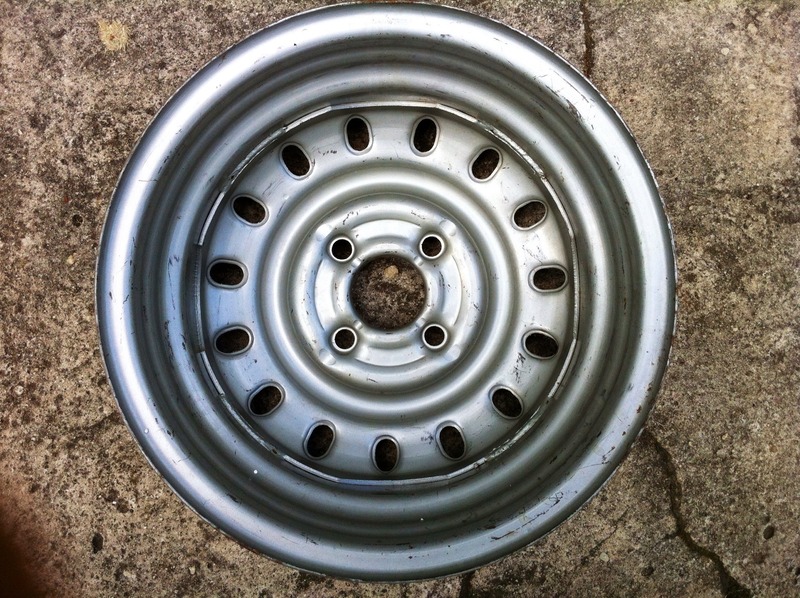 A few more years and I will be refinishing them again myself... with a spray can... of silver paint. Although the silver-face-with-black-back finish was the most common finish for Lemmerz rims on round taillight ‘02’s, there were certainly exceptions. 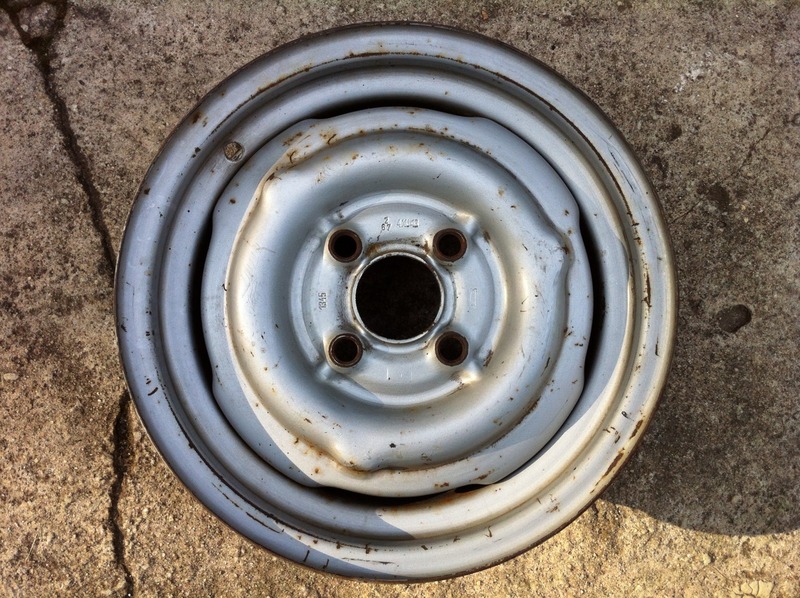 Below are two examples of original-finish rims that don’t follow the general rule. 1. A February 1967 (“2/67”) Lemmerz rim, 4.5”, from my ‘67 1600-2, has the back almost-completely painted silver (first two photos). 2. 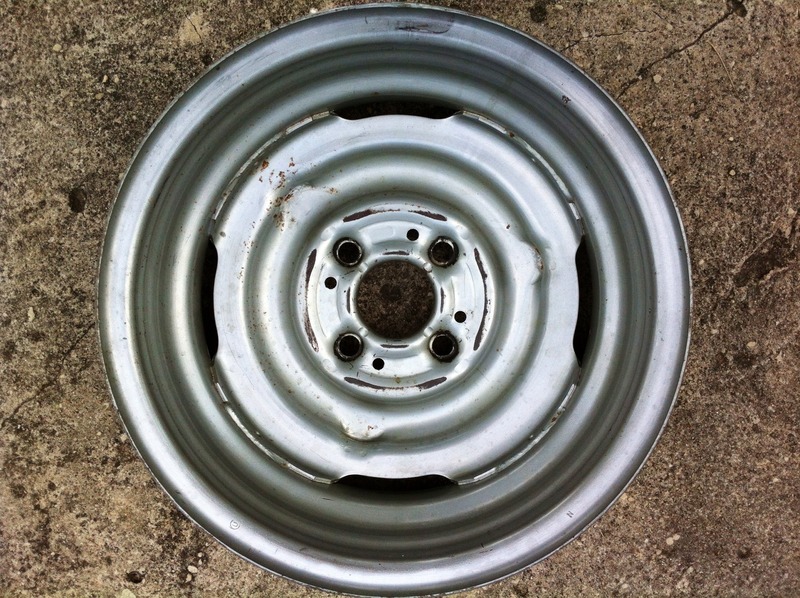 A May 1972 (“5/72”) Lemmerz rim, 5”, from a ‘72 tii I parted in 1974, has the back painted silver. 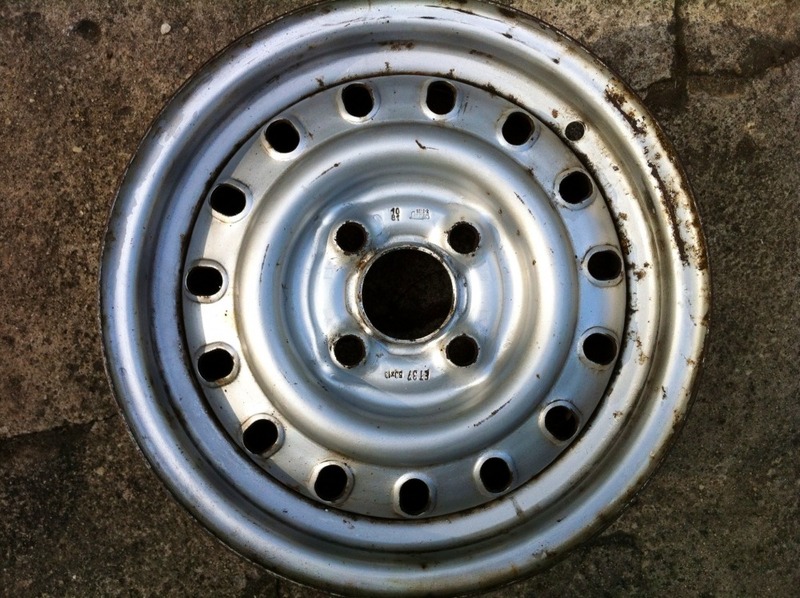 This is consistent with many other Lemmerz 5” rims (a.k.a., “tii rims”) in my collection and others which I have seen. Is it a 5” rim “thing”? I don’t know (third and fourth photos). And of course, those with Kronprinz and Solrad rims are not part of the silver-face-with-black-back regime. They appear to be factory silver on both sides. More data is always welcome. 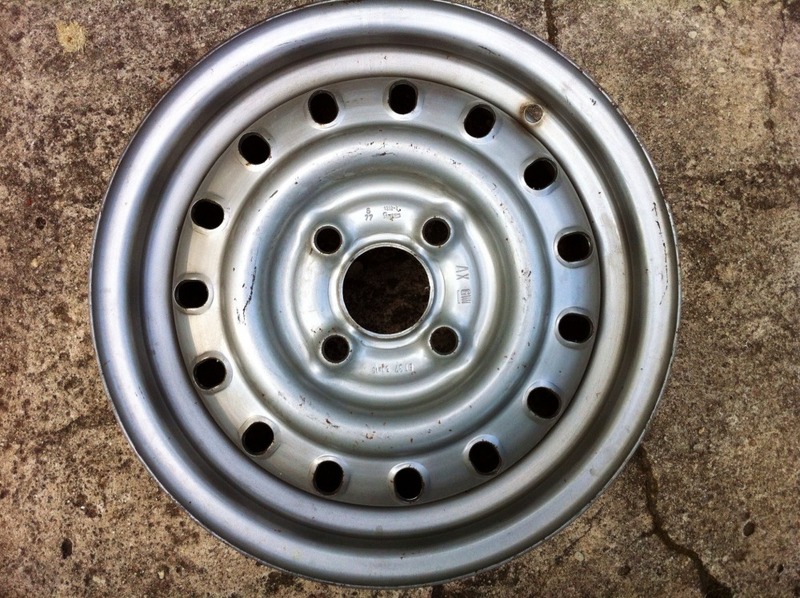 Steve, now you've got me curious...I have a bunch of 5" roundie tii wheels, both on my cars and in my parts department, so will have to check and see if the back sides were silver. I do know that the OEM 4.5" rims on both my '69 and '73 had black backs, as, interestingly enough the nearly identical wheels used on Opel Kadett station wagons, both 4.5 and 5" rim widths. 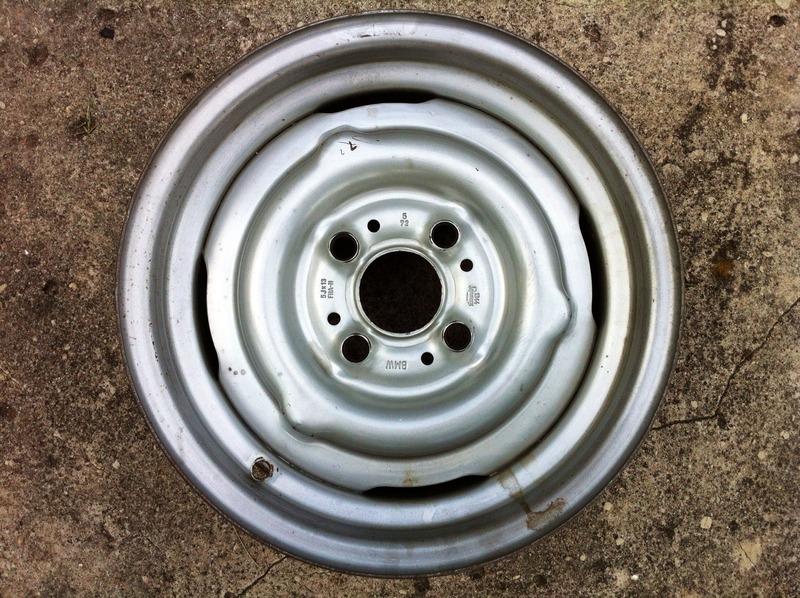 All my Opel wheels are the plain jane ones that are identical to the BMW wheels except they are stamped "Opel" on the center section, and the valve stem hole is in a different location in relation to the hubcap nubs.